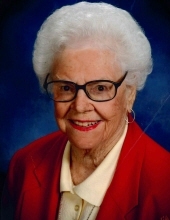 Mable Elizabeth Brettel - age 95; a native and lifelong resident of Mobile, AL, died Friday, February 1, 2019. Mable was a longtime member of St. Pius X Catholic Parish and retired from First National Bank of Mobile after 43 years of service. She was preceded in death by her parents, Emil Peter and Mary Louise Brettel; and ten siblings, Marion B. Reilly, Margaret B. Haig, Rosalie B. Ankerson, Emil P. Brettel, Jr., Charles Brettel, Ethel LaGrange Brettel, Cleo B. Chastain, Mary Rachel Burgess, Dolly B. Young, and Thomas T. Brettel. She is survived by numerous nieces, nephews, great-nieces, great-nephews, and other relatives. Mable’s family wishes to express their thanks and appreciation to Dr. Martin Lester and the staff of Covenant Hospice for their loving care of Aunt Mable. The family will receive friends from 10 A.M. until 11 A.M. on Wednesday, February 6, 2019 at the Sarto Center at St. Pius X Catholic Parish. Mass of Christian Burial will be celebrated at 11 A.M. on Wednesday at St. Pius X Catholic Parish. Interment will be in Catholic Cemetery. In lieu of flowers, memorials may be made to St. Pius X Catholic School, 217 South Sage Ave., Mobile, AL 36606 or the Child Advocacy Center, 1351 Springhill Ave., Mobile, AL 36604. Arrangements by Ascension Funerals & Cremations, 1016 Hillcrest Road, Mobile, Alabama 36695. To plant a tree in memory of Mable Elizabeth Brettel, please visit our Tribute Store. "Email Address" would like to share the life celebration of Mable Elizabeth Brettel. Click on the "link" to go to share a favorite memory or leave a condolence message for the family.